Like hundreds of thousands of enthusiasts around the world, Ducati has been rather special for me too. Italians are known to be warm, friendly people who like to enjoy everything they do, and by virtue of the fact that it is Italian, Ducati's motorcycles also echo that sentiment well with their playfulness. Needless to say, Ducatis are also some of the most evocative motorcycles boasting stunning performance, but admittedly, that isn't it. There is a special something about Ducatis that makes enthusiasts go weak in the knees. 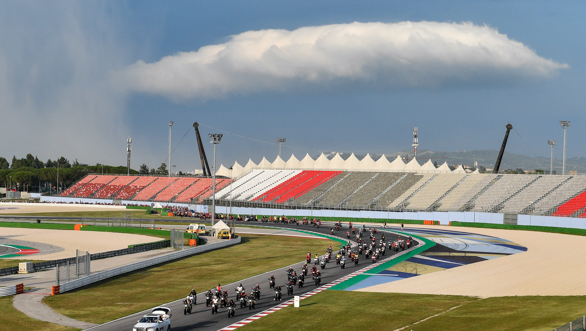 So just imagine getting to see thousands of Ducatis and almost 1,00,000 Ducatisti come together! 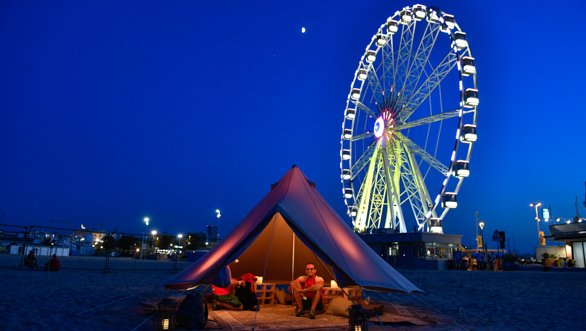 That's exactly what happened at the 2018 World Ducati Week, which, by the way was the tenth edition of the festival. 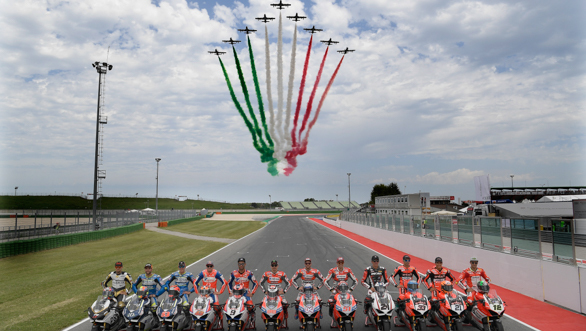 Starting 2008, every two years Ducati has held the World Ducati Week at the Misano World Circuit 'Marco Simoncelli' in Italy and expectedly, the 2018 edition was the biggest and also the most special yet. 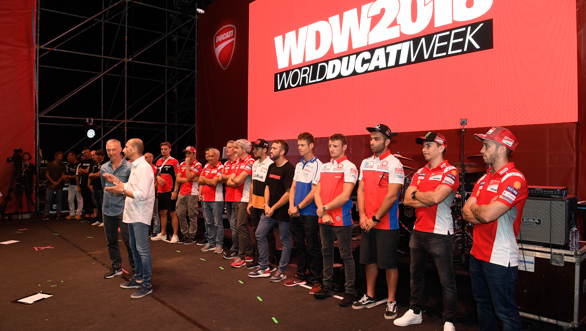 What truly made this time's WDW special was the fact that about 40 percent of the attendees were not Italian, which goes to show the kind of following Ducati enjoys as a brand the world over. In fact, two Ducatisti rode their Multistrada Enduros to Italy all the way from China, riding for seven days straight, covering a distance of 7,575km across 10 countries! The Misano World Circuit 'Marco Simoncelli' thus turned into a sea of red for the three days of the WDW as all you could see everywhere was red! In fact, I'd go as far as saying that the World Ducati Week is easily one of the biggest motorcycle festivals globally. I got lucky to be able to attend it this year, thanks to Shumi (who, owns the Ducati Multistrada 1200S himself!) was generous enough to let me attend it instead of going himself. And the experience certainly was very special. For the three days of the event, everyone followed just one religion, Ducati, irrespective of caste, creed or colour. 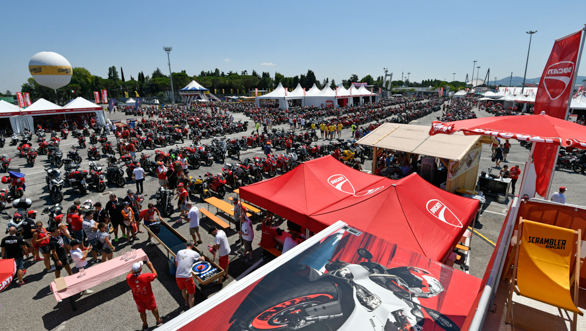 For those three days, the Misano circuit was a Mecca for everyone wanting to feast their eyes on all things Ducati  there were bikes, accessories, scale models, apparel, riding gear, memorabilia and more. 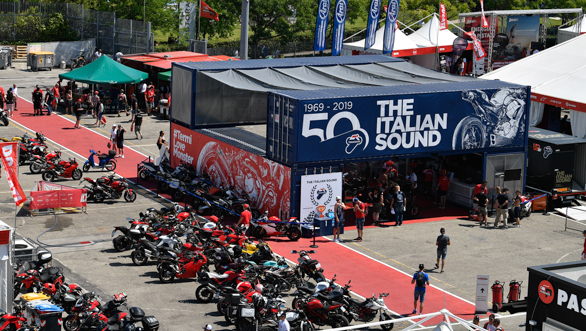 Every family of motorcycles from Ducati  Scrambler, Monster, Multistrada, Diavel and XDiavel and Panigale  had its own hall where the motorcycles were on display and each hall also had a dedicated technology booth explaining the motorcycle's tech. The Ducati Panigale V4 needs no introduction as the Italian manufacturer's most radical superbike yet and goes without saying, the Panigale V4 hall was the one where the crowds flocked the most. Ducati even had a Panigale V4 S cut into half on display to portray the bike's V4 engine, a first for a production Ducati. 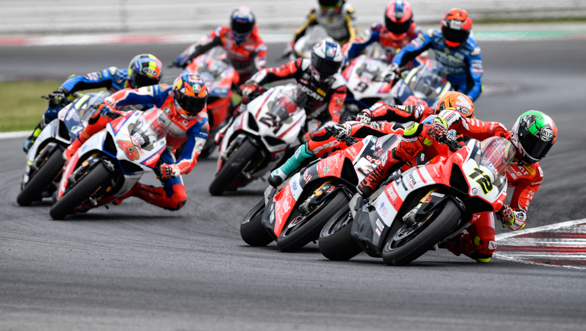 What's more, the 'Race of Champions' a race where Ducati's past and present MotoGP and WSBK racers race together saw all riders take to the track on the Panigale V4 this time. And if there was one thing more special than the Panigale V4 hall, it had to be the Race of Champions booth. The booth was home to a set of 13 specially prepared iterations of the Panigale V4 S, with each bike wearing the race bike number and customised livery of the respective racers. The bikes looked stunning to say the least and each bike was special in its own right. Actually, I'll tell you something even more special  after the race, all the bikes used in the Race of Champions were auctioned on eBay and were sold out in a record time! Not surprising at all when you look at the list of racers  Jorge Lorenzo, Andrea Dovizioso, Danilo Petrucci, Michele Pirro, Tito Rabat, Xavi Fores, Jack Miller, Marco Melandri, Michael Rinaldi, Xavier Simeon, Karel Abraham and Troy Bayliss. Chaz Davies had to pull out of the race owing to an injury, though he was roaming around in the pitlane before the start of the race, cheering his fellow racers. Casey Stoner was around too, though he did not race. The Race of Champions was a visual delight for everyone present as the racers went all out racing each other and even pulled long wheelies on the main straight (while racing!) to please the cheering crowds. I must say the adrenaline rush was immense and watching the race from the terrace of the paddock building along with fellow journalists, I found myself cheering the racers loudly! 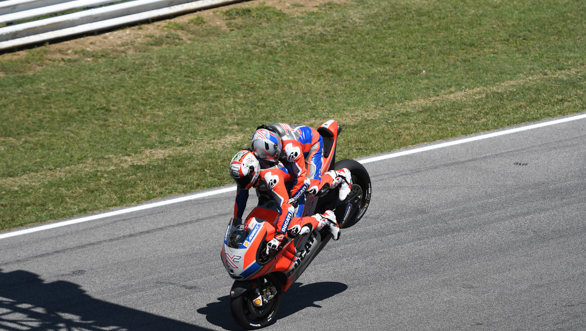 Michele Pirro, who is a wildcard/test rider for the factory Ducati team in MotoGP won the race while big names like Lorenzo, Dovizioso and Petrucci (who will replace Lorenzo at the factory Ducati team next year) all finished way down the order. That didn't stop the racers from celebrating though, with most of them pulling wheelies or finishing the rear tyres on their bikes with massive burnouts. 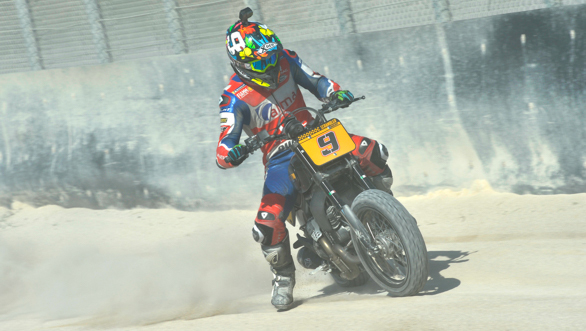 The racers also competed in a flat track race on a special flat track arena within the premises of the Misano World Circuit. The race a lot of fun to watch, to say the least, and also had its fair share of spills and crashes with the riders trying to outdo each other on gravel. 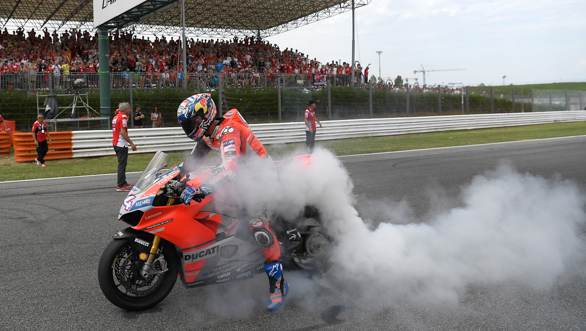 The flat track race was won by Andrea Dovizioso, finishing ahead of Xavier Simeon and Danilo Petrucci. Apart from all the racing, the racers also interacted with the crowds, answering questions in special meet-ups, apart from signing autographs in special autograph sessions held inside the paddock. As for the crowds there were a lot of activities to engage in, right from custom bike building championships to games to riding sessions on track. Attendees could also sign up for training sessions for flat track riding or DRE Enduro, where bikes were provided by Ducati. That's not it  the first day of the WDW saw ALL riders take their bikes on track, as everyone was free to participate in the Lap of Honour, riding their bikes on track in a convoy for one lap. 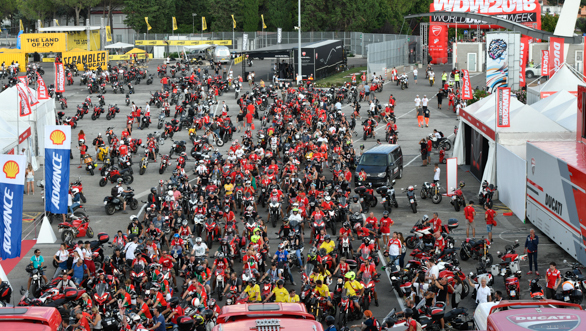 Thousands of riders queued up at the pitlane entry, which was a sight to behold in itself. As if all the action on track wasn't enough, each evening was made special too  the first day the Adriatic beach near the Misano World Circuit played host to the Scrambler Beach Party, while the second evening saw some enchanting live performances on a stage that was set up specially for the Ducatisti right in the heart of the Misano Adriatico town. The Scambler Beach Party held beachside at the Misano Adriatico even had Ducati CEO Claudio Domenicali take to cooking and serving the guests himself! 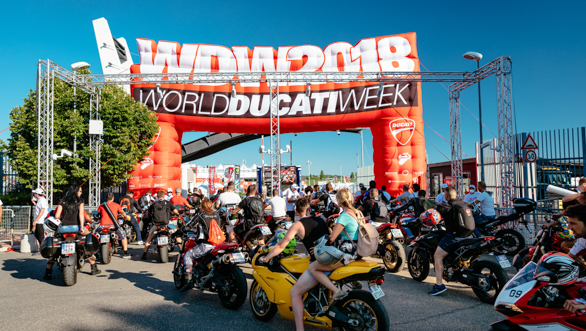 In short, the 2018 World Ducati Week was a dream come true for every fan of the iconic Italian motorcycle brand. 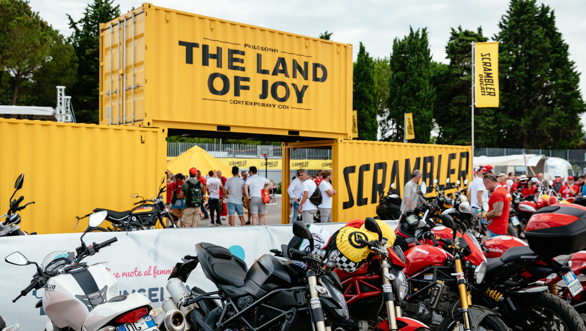 Be it the Ducati Scrambler 'Land of Joy' with the hot air balloon that allowed visitors to float 100 metres above the ground for a mesmerising view of the circuit and the WDW and the 'Scrambler Silodrome' that had specially trained stuntmen ride the Scrambler on vertical walls, or the 'closed room' that gave visitors a chance to take a peek at the upcoming Ducati project 1309, which essentially is the next generation Ducati Diavel that will be revealed to the world at the 2018 EICMA, or the Ducati SuperSport stand that gave visitors a chance to work with professionals in creating a special livery for the SuperSport under the watchful eyes of specialists from the Ducati Design Centre and also created personalised decals for their own bikes, or the opportunity to sit pillion behind none other than Randy Mamola on a specially prepared, two-seater Ducati MotoGP bike. I even got to meet up and chat with Carlin Dunne who won the 2018 Pikes Peak Hill Climb on the all-new Ducati Multistrada 1260 Pikes Peak! 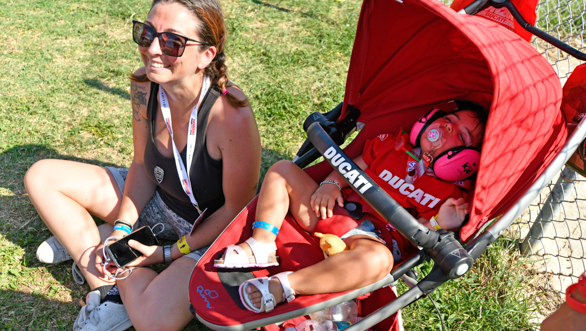 Everything at the 2018 World Ducati Week was, well, Ducati! 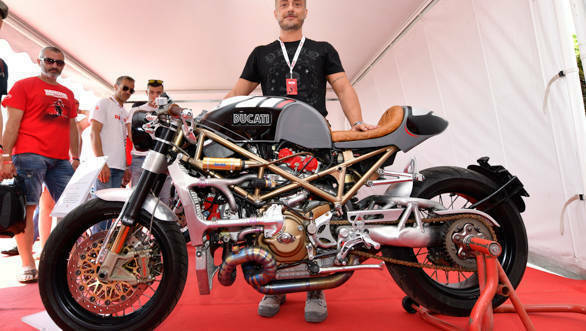 There was everything Ducati you can imagine and more, at the 2018 World Ducati Week. Phew. I could write reams on the event and still have more to say, that's how big the event was. A very special experience indeed. Thank you for passing on this opportunity, Shumi!